NEW YORK—As part of the build-up to the highly anticipated matchup between the Atlanta Falcons and New England Patriots, NFL commissioner Roger Goodell announced a new contest Wednesday offering fans the chance to present the Vince Lombardi Trophy to the winning team of Super Bowl LI. 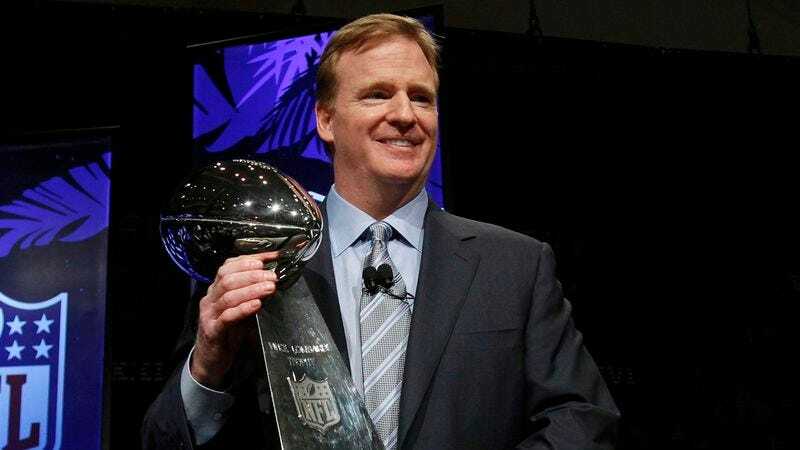 “This year, for the first time ever, one lucky fan will get the opportunity to go down onto the field after the game and hand the famed Lombardi Trophy to the head coach and owner of the Super Bowl champions,” said Goodell, adding that the randomly drawn winner would get to personally congratulate the team on the trophy presentation stage in front of over 70,000 fans at NRG Stadium and an estimated 160 million people watching on television around the world. “Not only will they pose for photographs while holding the Lombardi Trophy alongside the winning team’s ownership, but they will also get to shake hands with the player selected as Super Bowl MVP. I couldn’t be more excited to make one fan’s dream come true on Super Bowl Sunday.” Goodell added that in order to provide “the ultimate Super Bowl experience,” he will generously allow the contest winner to sit in the commissioner’s seat during the game while he watches it from home.